The most dense and active part of Gjovik now stands on the north side of the Hunnselva river, with little relationship with the closeby Mjosa and with the river itself. 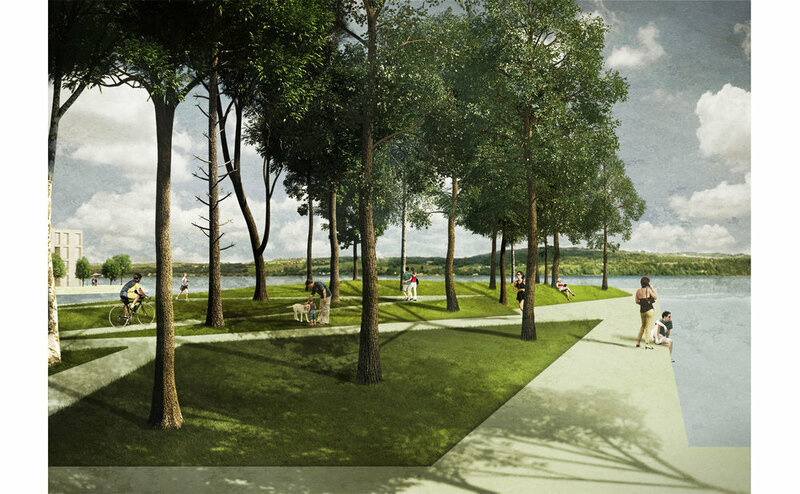 The urban plan envisions a network of connections, shaping dynamic public spaces, putting the accent on three nodes, to use them as catalysts of the relationship between Gjovik and the lake. We aim to develop a system of neighborhoods where culture houses, innovative housing, contemporary workplaces and ecological opportunities come together in a sustainable whole. Specific and generic spaces are balanced to create an attractive environment, providing culture, leisure and services, with the inclusion of waterfronts and public parks for recreational activities. City life needs to be the starting point for this planning process, placing particular emphasis on integrating functions to obtain the spatial and programmatic complexity that characterizes good public spaces.